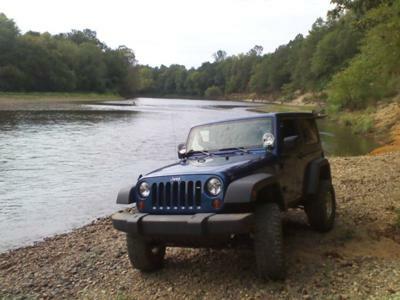 Our 2009 Jeep Wrangler JK aka 'ol Blue! Always wanted a Jeep since I was a child, but never could afford one with getting married and the kids growing. Then one day the wife decided she wanted one and to trade her Chevy in on it. So I said yeah "go for it, never liked Chevy's anyhow"..thought they were over-rated. So before the kids got grown and we were too old to climb in it we decided to get one. Then, she said if it's not blue we are not buying it. So, we looked for three months and finally found one in Hot Springs, Arkansas that was not $26,000 and was brand new. At that time is was a 2009 model and the only new vehicle we ever owned. I wish I had one a long time ago. Best money I ever spent and the most fun. We put a three and a half inch lift and 33 inch tires and we're still adding stuff. Larry's Comment: So who gets to drive 'ol Blue the most...you or your wife? From the photos it looks like you are getting a lot of good use out of Ol' Blue. 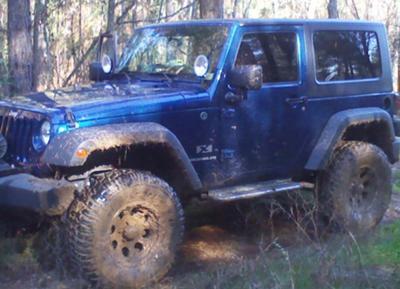 Liking your blue Jeep, and so does the wife. I have had several different Jeeps in my time growing up. I got married when I had a '75 CJ5. 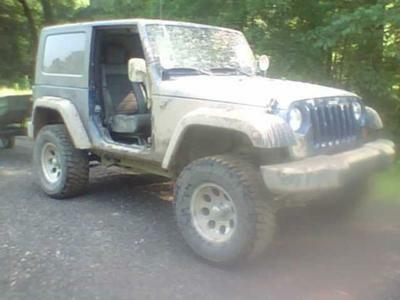 The wife and I took it off road one time, and I drove it a couple of times with her, and then sold it. Times got hard for us at that point. Well two years later I just bought a '91 YJ Wrangler, and she has drove it a hand full of times and now she wants one too, but she wants a TJ. So when she does get to drive my Jeep she acts like a young teen. Boy, I can't wait for her to get her own. Just bolted a Warn 8,500 lb model m8274-50 on it. I JUST BUILT A NEW BUMPER FOR IT AN INSTALLED THE WINCH ON IT.